Available now at Club Energy's Christmas Cottage! Join Club Energy and get this and other free gifts by wearing the group tag! 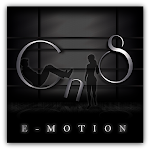 In the next day or so, this will also be a Christmas group gift for CnS e-motion until the New Year...get it while you can!